This is an interview with Melissa Jhunja who, as a social worker and avid volunteer, has always been drawn to service in a variety of ways. She became particularly interested in human rights and social policy as she went through a master’s program in social work, and wanted to find ways to serve those who often have their rights violated, or lack basic human rights. She heard about the Prison Yoga Project in 2012 and was immediately drawn to the idea of bringing a yoga practice into prisons as a means to heal, and to cope with the reality of life behind bars. She later began teaching veterans through Connected Warriors and later with Exhale to Inhale, which brings yoga to women survivors of domestic violence and sexual assault. Melissa: I was lucky enough to stumble upon my first yoga class about 12 years ago at a gym where I was a member, and I tried it mainly out of curiosity. As my practice continued I began to notice a profound healing effect on my body and mind. I was hooked and continued to reap emotional, spiritual, and physical benefits, largely because I had the resources to do so. I knew there were many others out there who, like me, could benefit from the healing qualities of yoga practice, but either couldn’t or wouldn’t easily find themselves stepping into a yoga studio. It felt like yoga was hidden in plain sight – how could I get others to give it a try? Hearing the ways yoga has helped people shift perspective, heal injuries, relieve tension, and calm the mind. I like hearing these first-hand stories from my students, especially those who hesitated the most initially. I like to see them returning again and again to share their experiences with me and with others, and to continue to deepen their practice. They taught me that I am always a student – I learn so much from them! They’ve shown me how strong and resilient one can be in the face of adversity, trauma, hardship, and pain. They teach me to never judge a book by its cover, and that yoga is for everyone. Yoga is freedom despite physical incarceration for the prison populations who learn to find liberation within. For the women I teach through Exhale to Inhale, yoga is freedom to reconnect with their bodies, breath, and minds in a positive way. They reframe prolonged negative associations, allowing them to continue to move forward in the healing process with a more powerful sense of self and choice. Yoga reconnects the women I serve with mind and body in a positive way, despite the stress life can bring. If we can relate to our own minds in a more clear and open, respectful and curious way we can relate to others in the same manner. In this type of practice we begin with ourselves, building up this “muscle” of being more mindful in our own daily lives, such that it gains strength and radiates outwards to other aspects of our experiences. If I could pack a “bag” to teach in the shelters, I think the most important element would be an open mind. The key is putting the “teacher” hat away and switching to a facilitator role; empathy and humility are some of the essentials. The women I work with do not need a perfect asana class. They need the freedom of choice to connect with their bodies, to befriend their breath, and re-friend their mind. That said, they really each need something different, as they are all individuals. I would advise someone about to teach in a shelter to expect nothing, and to stay fully present with each student, in each moment. If you create a safe and empowering space first and foremost, then everything else will follow. Success in these roles is not about how much they liked the sequencing in a class, but about the tools they take with them. If students recognize and learn how to use their breath and their meditation as tools to promote their own healing, then they’ve started to connect with their own power and strength, which is the ultimate success. I hope that it becomes an established part of all yoga teachers’ schedules. I hope that it is explicitly discussed as a component in all teacher trainings – the importance of giving back and karma yoga. I hope to see more yoga in unconventional places such as prisons, shelters, hospitals, veterans’ centers, and public schools, where I hope to see it reaching a broader set of students. I hope we can dispel the notion that you need a lot of time or money or a gym membership to establish and benefit from a yoga practice. I think service yoga can serve to expand and break those stereotypes and barriers. Bringing this healing and transformational practice to many more of those who never expected to step on a mat is my hope. Gaiam’s Untangle meditation podcast features real people with extraordinary stories, and experts who have devoted their lives to teaching and helping others through meditation. In this episode, host Patricia Karpas sat down to talk with Prison Yoga Project founder and director James Fox. 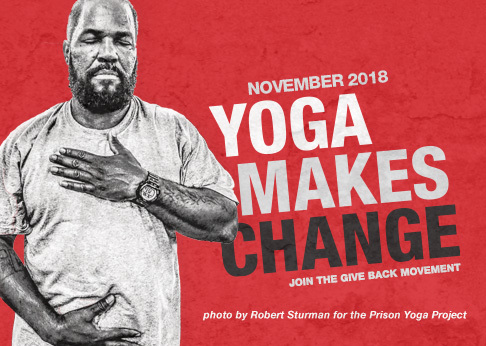 Prison Yoga Project was founded in the belief that yoga and mindfulness can bring about change in prisoners who have been impacted by chronic trauma for most of their lives. James’s work has taken him inside San Quentin State Prison, where he’s taught some of their most violent offenders. Here’s his story. “I said, this is your opportunity to leave prison for the next hour and a half that we’re together. This is out of bounds from the rest of the prison. You don’t have to deal with prison politics. We’re here to practice together. Now, there’s a new way to give back from the mat: Give Back Yoga’s 108 Studio Partnership Program. We’re inviting studios across the country to join the Give Back family and raise funds for a service program of your choice, helping certified yoga teachers and yoga therapists to bring this healing mind/body practice to those who are most vulnerable. Over a one-year period, partner studios give back by hosting a monthly, bi-monthly, or quarterly fundraiser to help bring yoga to those who might not otherwise experience this transformational practice. This can be as simple as a donation class held on a specific day each month. Or it can be an exciting opportunity for your community to come together for special events such as a 108 Sun Salutations practice or a guest teacher, speaker or artist. Our 108 partners also host a “Give Back Yoga Month” to jump-start the program and raise awareness for Give Back Yoga’s mission, sharing information during regularly scheduled classes and collecting donations at the front desk. Eat Breathe Thrive: Fostering positive body image and overcoming eating disorders. Mindful Yoga Therapy: Helping veterans to find a calm and steady body/mind. Prison Yoga Project: Teaching skills for non-violent problem resolution and healing. Give Back Yoga: Supporting our operations to cover our largest areas of need. Becoming a 108 Studio Partner can help studios to build a close-knit community of the heart by gathering students around a common cause. It’s also a way to help students begin to explore and practice karma yoga, by giving back a gift that has touched each of their lives — the gift of a practice that can transform from the inside out. The 108 Studio Partnership Program can also help studios to raise their online and local presence, as organizers work with community partners and Give Back Yoga to cross-promote events large and small through online and offline channels. Additionally, Give Back Yoga issues an end-of-year tax receipt to all active 108 Studio Partners, which may help your studio to offset expenses. Become a 108 Studio Partner or learn more: email 108@givebackyoga.org to request information on getting started. Main image courtesy of Merrick Chase Photography.